Beechwood has spectacular panoramic views over the River Dart towards Dartmouth, the Britannia Royal Naval College and upstream towards Dittisham. You can sit for hours watching the passing watercraft and the steam train that regularly runs on the Dartmouth to Paignton line below the property. Dartmouth Harbour welcomes luxury yachts, ferries, fishing trawlers, naval and cruise ships. Built into the hill at Kingswear the house is designed over three floors with the entrance conveniently at road level. On the ground floor are two attractive bedrooms, both with fantastic views and a family bathroom. The upstairs loft room also has river views; this room is most suited to children due to the sloping ceiling and low bed. 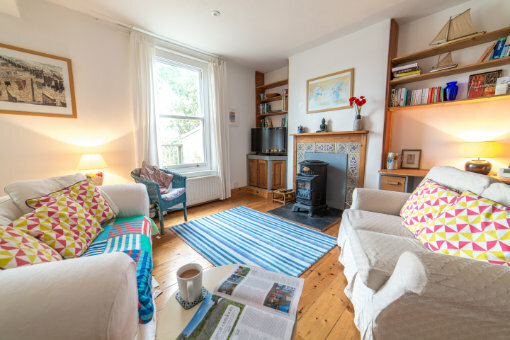 The open plan living area is ideal for families to enjoy time together – playing board games, listening to the radio or a CD, or reading from the selection of books. Patio doors open onto the sunny terrace where the ever-changing river scenes can be enjoyed at leisure. The kitchen is well equipped with oven, dishwasher, fridge freezer and everything you need to dine in. The property itself has a very warm and homely feel to it. The village of Kingswear has a church, school, shops, three pubs and a popular bistro and is also the stop for the Paignton and Dartmouth Steam Railway, one of the most picturesque lines in England. All are within walking distance of Beechwood (it is a steep walk back uphill or for ease, park at the Marina car park). Dartmouth is a wonderful place to while away the day and is only a short, scenic trip by car or passenger ferry. Explore the ancient, narrow streets with boutique shops, art galleries, gourmet restaurants and alfresco cafes or enjoy one of a variety of river cruises along the River Dart. You can also hire a motor boat or jump on one of the many passenger trips operating out of Dartmouth to either head up the river towards Dittisham, or out to sea for the more adventurous of you!